One of my favourite demo effects is a vertical twisting and rotating oblong. I'm trying to recreate this (admittedly firstly on the PC using Blitz Basic but then maybe on the amiga later as I've re set up that under WinUAE). 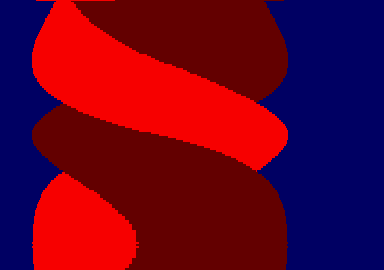 I've created what looks like the oblong out of a stack of 1-pixel-high horizonal lines which seems to rotate nicely when solid but when I tried warping it with sine curves and it just looks warped and not twisted. Is there a pseudocode (or readable code) which does this anywhere that I can look at? I'm not great at these demo effects (I've only nailed starfields and sine scrollers so far!) but my mate challenged me to write a demo in Blitz for the PC and later the Amiga. I shouldn't agree to things when drunk! Then you just connect these points, i.e. you draw a simple horizontal line from x1-x2;x2-x3;x3-x4;x4-x1. When you draw the lines, you have to check that xstart<xend, if that check fails you don't draw the line. That's basically all you need to do for a simple twister. Now it's your turn to code it. You also need a routine to fill the "fake sides" of the twister, so it looks like it is twisting and not just shrinking. Like this (for extra coolness, use the copperlist for gradient). First question: what are "fake sides"? Second question: What does a horizontal line drawer do? 1. By "sides" I mean the two different regions, e.g. red being side 1, and dark red being side 2. Lousy way of putting it, but I'm sure you catch my drift? Now I assume I get an answer like "You have no idea how to code a twister", which of course is more than correct, but it doesn't mean I don't know how cool twisters should look like in my opinion. He asked for a simple twister algorithm. That you can easily improve that very basic algorithm should be clear (draw textured lines, add light sources etc. pp.) but that is not exactly the topic here. You assume a lot of things. Also, you might want to think what is more helpful here, your post which mentions "fake sides" and other "interesting" things or a simple and easy to understand explanation of the basic twister algorithm. Last edited by StingRay; 28 June 2011 at 10:50.
my god, I was overcomplicating things immensely! My code was over the top, caused a nice warp, but didn't twist! Thanks. EDIT - It works, can't believe how simple it was. I've got to try and not find the complicated solutions! I made an asm twister a while ago now - it's held in my unreleased effects stockpile. It works, can't believe how simple it was. I've got to try and not find the complicated solutions! Now time for your Amiga assembler version! well, the test was done in blitzplus for pc. It's not optimized and very wasteful, but a great basis for me to work on! Any chance of a .exe of that so the non-Blitz guys like me can see it in action...? Looks fine to me, have fun playing around with the code and improving twisty twister. As a test I tried to copy the code into Amiga Blitz Basic 2, odd thing is, I only changed the multipliers because of the resolution and now get an almost triangular one. I do suspect that a lot of optimizing will be needed for a miggy version in Blitz. It's been a while since I used blitz on the Amiga though, I had to dig out my old yellow Blitz Basic 2 manual! Last edited by TCD; 28 June 2011 at 15:02. Reason: Back to back merged. Use the edit function. that's cool! I've tried it in my code too. ps nice looking language, reminds me of my first coding on the speccy! ah, the reason (culprit) for all this appears! EDIT : and I challenge you to do the ASM version since your using it at the mo! I assume a lot of things indeed, but I frankly don't know what answer I can expect from you, it's mostly picking on my errors in a rather annoying way. As the thread is evolving and starting to be open for other ideas, my suggestions might as well be appopriate to this thread after all. And "fake sides" was not a very bad explaination, given there exists twisters with the feeling of 3D sides w/ fake light sources. Or should I say light sources? Real light sources, better? The reason I say "fake" is because it's pure cheating, coding wise. It's like calling a dragonball a ball, code wise (like I did in #flashtro some years ago ). This is what I mean, and with some more maths you can create the feeling of different sides on the twister, like walls.